Settled in Einstein's Bagels on New Years Day, you would find Allison Riffe and I reflecting on our year and refocusing on what is to come. Here, we state the victories and challenges from the year and declare the goals and visions for the year ahead. This time is a solid three hours of declarations of the Lord’s faithfulness. Our time has been a special tradition for the last four years. During our time, we each take the time to share the deepest parts of our hearts from the year. We are honest and vulnerable with each other. Allison and I end our time by creating a word or a phrase that will sustain through our year, allowing us to connect on such a sweet level. When I was off at college and she was still in high school, we would simply send those words to each other to remind us of the truth we had began our year with. Though we may be in different seasons, it allowed us to have a common bond. I chuckled in dismay at the question, but quickly realized that she may be on to something. I realized that though I do share my heart, it seems to be filtered first. There is a need in me to come off polished even in my distress. This was a tendency I did not purposefully do but something that got the best of me. This year, my phrase was humble obedience for eternal victory. Humble obedience in what the Lord has called me to do for the victory that is found in the freedom that the Lord pleas for me to walk in. Allison Riffe and I shared this phrase. At the beginning of the year, I was conquering the humble obedience as she was conquering the eternal victory. 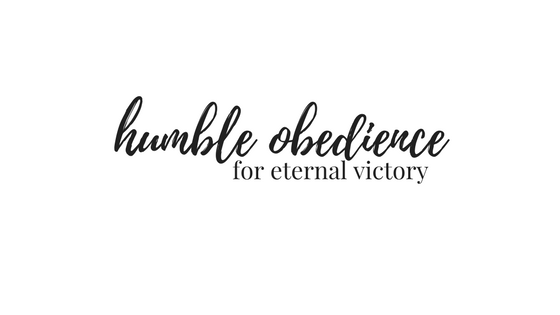 The shift occurred for our souls mid year where she began to truly practice and understand the humble obedience and I was captivated by the eternal victory. We both clung to the same phrase in two totally different seasons of life. The Lord is special in that way. I’m really good about sharing what I’m learning, but not about the things in my life. My heart has a hard time. I never want to boast and I really want to be humble so I end up keeping some things to myself and not sharing in community. Little did I know, that was pride welling up inside of me. As I write my reflection for 2017, I’m a little apprehensive. Here I must let the enemy flee from creeping into my thoughts and perceptions. Simply, I am celebrating the Lord’s faithfulness and goodness as seen in 2017. This year, I served on a team that chose to find success in the relationships that we made and less in our accomplishments of numbers or awards. This team was made up of 11 incredible women with incredible advisors that have sacrificed and served for an organization that has greatly served us. These women each portrayed unique talents and gifts that served the chapter well. These women were fearless and grew together in confidence. We learned to say, “thank you for your patience” instead of “I’m sorry.” At the end of our time, I looked around the table to see 11 women much more confident and wise. Our team was able to be cheerleaders for a group of 300 incredible leaders. Having the opportunity to lead leaders is quite a task that was fulfilling to observe. At one point during recruitment, I found myself looking around the room to see many women leading and doing their deal that the Lord so instilled inside of their soul. For the first time, I saw what it’s like to have group work as a body. Each part is incredibly important. That night, I went to bed with a sigh of relief and a full heart. It was a pleasure within itself, and a calling that I am grateful that I accepted. The Lord asked me to walk out of my boat of comfort and in obedience to the water. The confidence that I began to develop and cultivate was seen in promoting Gather & Grow. A little dream that turned into a reality that exceeded my wildest dreams. This dream started as a seed and has now produced fruit. This dream is not done, but only in due time will this continue to grow. I learned to say yes to the small things and watch God turn them into big dreams. I learned the importance of praying big circles. The posture of prayer changed for me. This was a game changer and made a radical difference. This year, there was a tendency in me to hustle. Sitting still to rest was an idea that I could never conquer very well. I felt the need to strive and go and be and do There was a need to prove myself through the things that I achieved. Deep inside of me, I craved the satisfaction of the chronic pace of fast. In this pace, I felt verified and enough. My worth was satisfied here and then I found that my heart was addicted to hustle. To this day, I have been learning about Sabbath. There was a week after camp and before going back for recruitment that I spent some time with my aunt in Colorado. This was my Sabbath week where I allowed myself to just sit. I knew that this week was not going to fix me at all or even cure my weary soul, but I knew that when I returned to the chaos that awaited me, I would be much more willing to proceed. The idea of hustling is something I believe that we all are wrestling with. There is this deep desire in us that wants to be the best and work the hardest so that at the end of the day, you now that your body deserves that rest. This was a harsh reality that I was able to voice out loud yet scary as I realized that magnitude at which it has overcome my manor. Last night, the gun went off as we all sprint into the year that is ahead. Eager and excited, we head into the year with goals and dreams that we are ready to endure. With that, I realized I have the power to start my pace off slower than I would like to. There is something special about working hard and I am all about it. But the moment that is drags my weary soul into the ground is where I have to draw the line. As my addicted soul yearns for busy, I slow my pace. The pace may increase or decrease as the year inches on, but I would rather to build my stamina. This practice will let my heart welcome in Sabbath with open arms. 2018 will be a year where I pray that Sabbath can become a part of my everyday life, regardless of my season of life.